The Martyred Intellectuals Memorial (Bengali: বুদ্ধিজীবি স্মৃতি সৌধ) was built in memory of the martyred intellectuals of the Bangladesh Liberation War. The cornerstone was laid in 1991. On the night of 14 December 1971, over 200 of East Pakistan’s intellectuals including professors, journalists, doctors, artists, engineers, and writers were rounded up in Dhaka. They were taken blindfolded to torture cells and were later executed en masse. In memory of the martyred intellectuals, 14 December is mourned in Bangladesh as Shaheed Buddhijibi Dibosh (“Day of the Martyred Intellectuals”). 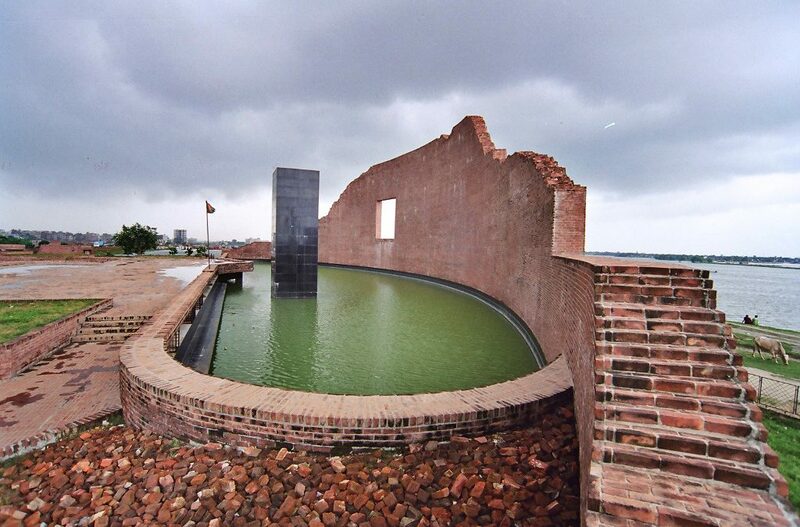 The main element of the monument is the long curved brick wall, representing the original brickfield of Rayer Bazar where the dead bodies were found. The wall itself is broken at the two ends, demonstrating the depth of grief and sorrow. A square window at the south-west side of the wall permits visitor’s view to reach the sky behind, representing hope. In front of the curved wall is a still water basin from which rises a black granite column, which represents grief.